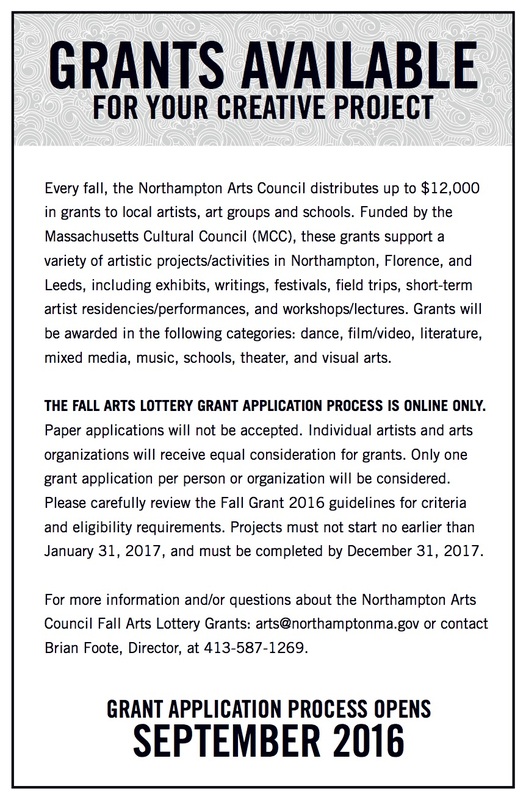 NORTHAMPTON ARTS COUNCIL SEEKS FUNDING PROPOSALS--Proposals for community-oriented arts, due October 17th, 2016. The Northampton Arts Council has set an October 17th deadline for organizations, schools, and individuals to apply for grants that support cultural activities in the community. 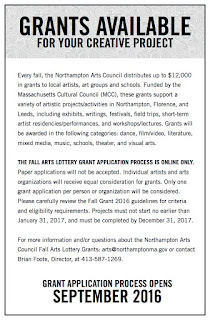 According to Northampton Arts Council Director Brian Foote these grants can support a variety of artistic projects in Northampton, Florence, and Leeds-- including exhibits, festivals, field trips, short-term artist residencies, or performances in schools, workshops, and lectures. This year, the Northampton Arts Council will distribute about $11,590 in grants. For local guidelines and complete information on the Northampton Arts Council, contact Brian Foote at (413) 587-1269 or arts@northamptonma.gov. Application forms and more information about the Local Cultural Council Program are available online at http://www.mass-culture.org.